The Society for the Anthropology of Consciousness held its 30th Annual Conference; Curing Minds: Consciousness and Healing, in March, 2010. Audio from the segment entitled Perspectives on Ayahuasca Healing is available now on the SAC website. The papers in this panel will explore a range of perspectives on healing related to the entheogenic plant mixture ayahuasca, traditionally used in the Amazon basin. Bringing together perspectives from diverse disciplines, it will shed light on the ways healing takes place in an ayahuasca ritual, the ways it is perceived by participants and even explore the ways that ayahuasca can be integrated in more western modes of healing. 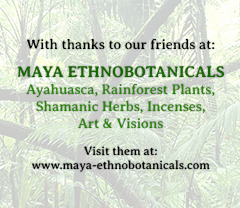 These papers will address the question of the healing potential of ayahuasca in a global environment and provide much needed insight into the modes of healing of entheogens in general.